How to change the wsdl import in a JBoss 6.3 deployment? I have a Web Service running on JBoss 6.3.0, as ypu can see i made a deployment, and that's my URL, but i'm having a problem, because all of the references on the web service are pointing to localhost instead of my server name. So when I try to use the web service remotely I can't see the java classes I need. In the next picture you can see the webserice URL with the references pointing to Localhost instead of my server blazesvr1. I'm new to JBoss and I don't how to configure the web service to stop pointing to localhost and point to the server. The application is generated by Blaze Advisor, but I can access to deployment files and make changes in the code. 1. 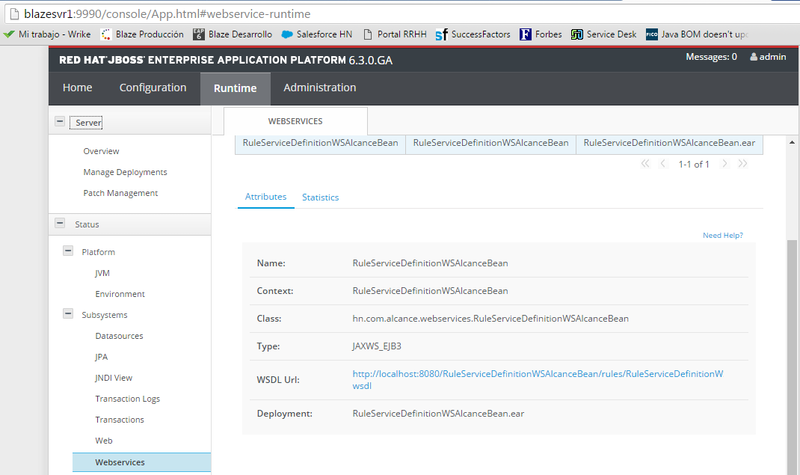 Re: How to change the wsdl import in a JBoss 6.3 deployment? Then reload your server, and the WebService works fine remotely.